There is some confusion over the exact location of the find. The paper The Roman Body Found on Grewelthorpe Moor in 1850: A Reapraisal 1. states “,Two brothers, Edwin and John Grainge of Castiles Farm, Kirkby Malzeard”, exposed the body while cutting peat. Castiles Farm is on the Pateley Bridge Road just past the Drovers Inn. It is therefore possible that they were cutting peat above their farm on Skelding Moor however as you will see later by 1850 they in fact lived and worked in Bramley Grange. 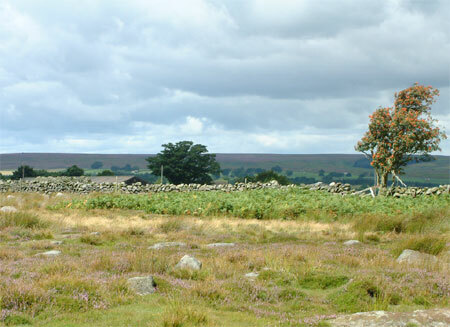 This picture was taken from Skelding Moor in August 2006. You can just see one of the buildings of Castiles Farm just over the wall and Grewelthorpe moor is in the far distance at least two miles away. 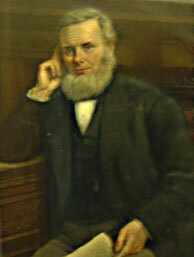 The following paper by Thomas C Heslington was read in 1867 before the Scientific Society of Ripon. ‘,A few years ago some workmen digging for peat on a farm, on the moors near Kirkby Malzeard, made one of the most extraordinary discoveries, of its nature, ever disclosed. This was the body of a man –, evidently an ancient Roman –, which the peat had tanned, dried and preserved in a remarkable manner, like (as the people say who saw it) an Egyptian Mummy. The robes were quite perfect and the material tough –, having been tanned and preserved by some natural agency. The toga was of a green colour, and some of the dress of scarlet material, the stockings of a yellow cloth, and the sandals cut out in a beautiful shape –, like those found in the Thames some years ago –, and were likewise finely stitched. It would appear that once the peat covering the body was removed it started to deteriorate quickly. By chance William Grainge had left Castiles farm to work as a Solicitors Clerk in Boroughbridge and later became a well known writer on the history and topography of our area. He wrote the following account which was published in the Ripon Millenary of 1892. .’,. . . the sandals of a finely artistic shape, one of which was preserved and we believe is now in the Museum of the Yorkshire Philosophical Society. The flesh was tanned into a kind of white fatty substance, and had a very offensive smell. No coins or weapons were found about the body. He was probably some wanderer who had lost his way and perished in the bog in which he no doubt reposed for 1400 years. The remains were finally interred in the Churchyard of Kirkby Malzeard’,. Further investigation by Barbara Bradley shows that by 1850, when the body was found, John and Edwin Grainge had in fact moved to Bramley Grange and the better developed peat cutting areas of Grewelthorpe Moor were easily accessible to them. 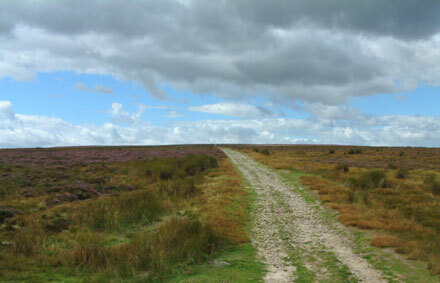 The turbary on Grewelthorpe Moor has been an important source of peat to be used as fuel for centuries. The monks of Fountains Abbey were granted the right by Roger De Mubray to “,dig turf in the turbary of Thorp in Kyrkebyshire as much as necessary, and carry it where they will, without hinderence bey him or his heirs”, in 1255. In their paper (1.) Turner, Rhodes and Wild confirm that the relics which remain, in particular the shoe sole, are of a man who died during the period of the Roman Occupation but they are vague about the location of the find. They also state that the rustic appearance of other items of clothing and the quality of the repair to the shoes indicates that it was not a Roman Soldier but more likely a civilian. They also say that “,He probably died through exposure or other natural causes and was buried by chance in the bog”,. Grewelthorpe Moor Has some very marshy areas eg Foul Sike Wham shown here on the Ordinance Survey Map. There are also a number of ancient tracks across the moor, perhaps our Roman became lost trying to follow one of these in bad weather and fell into a bog.